While we’re still waiting for the 2020 Mustang Shelby GT500’s power output to be confirmed, Roush Performance has already cranked the 2019 Mustang up to over 700 hp to help ease the wait. Presented in a Race Red finish, the tuner’s Mustang Stage 3 adds a Roush TVS R2650 supercharger to the muscle car’s 5.0-liter V8. As a result, the modified Mustang produces 710 hp and 610 lb-ft of torque. No performance details have been revealed, but it could be nearly as fast as the 2020 Shelby GT500, which can hit 0-62 mph in around 3.5 seconds, do the quarter-mile in less than 11 seconds, and reach a top speed of a manufacturer-limited 180 mph. Roush also equips each Mustang Stage 3 it builds with an active exhaust system offering four different exhaust settings, including a ‘Custom’ mode which allows owners to finetune the supercharged V8 soundtrack. Complementing extra muscle under the hood are several exterior modifications. At the front, the Roush Mustang Stage 3 includes an extended front splitter, bespoke grille, and new air intakes. The car also comes equipped with a distinctive hood with air vents, optional 20-inch black sports wheels, custom side skirts, a distinctive rear lip spoiler, and a rear diffuser. 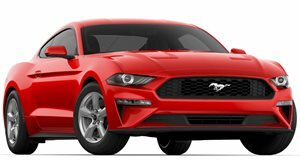 The 2019 Roush Mustang starts at $21,925 above the base vehicle. In addition to the 2019 Mustang, the tuner has also revealed the 2019 Roush F-150 pickup, which rides on an upgraded Roush/Fox 2.0 suspension with a two-inch lift at the front that gives the pickup an aggressive stance while also improving the off-road stability. The Roush F-150 also gets an active exhaust system like the Mustang, as well as a new front grille, flared fenders, a front bumper cover, and optional trail-inspired graphics. Pricing details haven’t been released for the Roush Mustang Stage 3 or the lifted F-150, but both models will be on display at the 2019 New York Auto Show next week.